In the mean time, we did, on November 3rd embark on a lovely Caribbean cruise and it’s time for me to share some photos from that adventure. 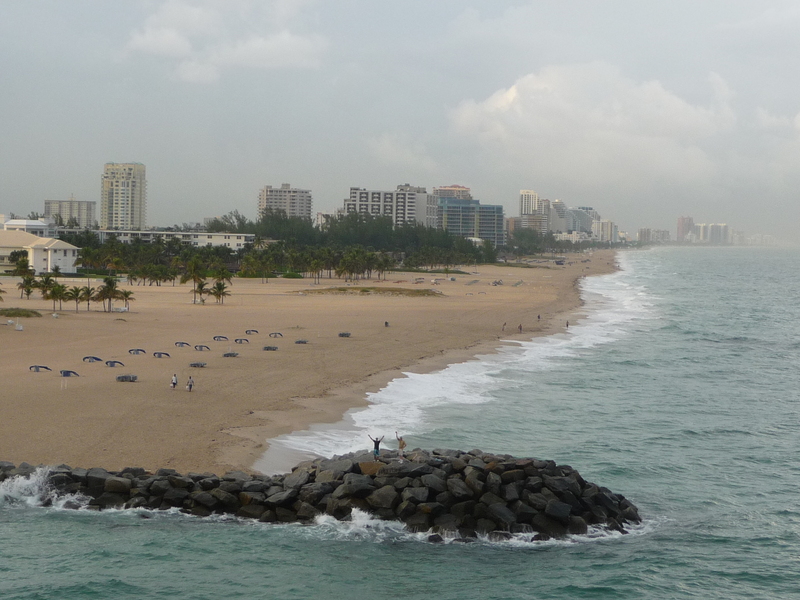 We left port from Fort Lauderdale Florida after flying in to Miami overnight from Seattle. Those red-eye flights are wicked. That’s all I’ll say about that. As you can see by the photo above, the weather wasn’t what one would call “picture perfect”. In fact, we knew that out there in the vast Caribbean Sea, even at the time of our departure was Hurricane Tomas swirling himself all over the place. What could we do? Well, we chose to sit back, relax and enjoy despite the threat of Tomas. 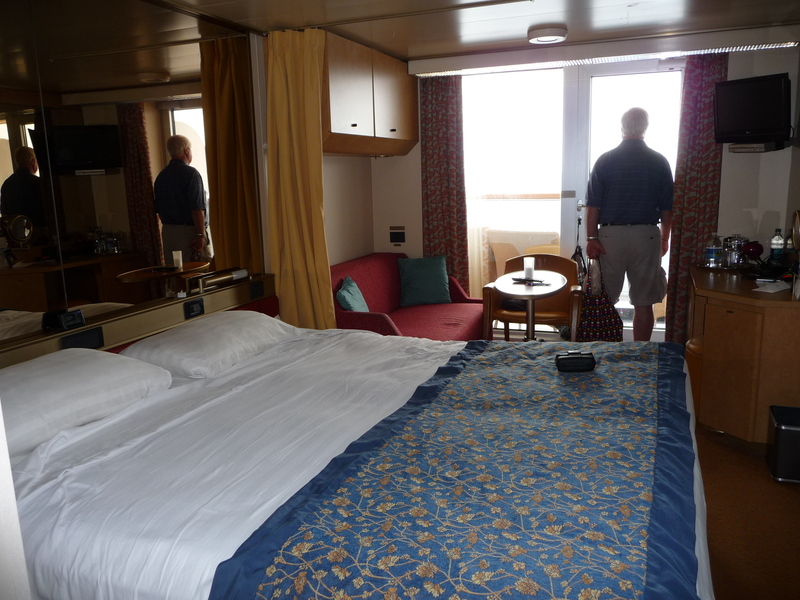 Above is the snap of our stateroom and hubby staring out past our little balcony to sea. We loved the king sized bed! We loved the cabin steward who cleaned the bathroom twice a day and straightened the stateroom just as often. We also loved the fact that you unpack your stuff just once and then stash the empty suitcases under the bed and forget them for a few days. Yes, those are some of the pluses for cruising. Our first port of call was supposed to be Half Moon Cay. Because of the strong winds, tides, and the approaching storm, we never set a toe onto the private desert island. SO disappointing. There went the kayak trip and sailing on the Hobie Cat, and swimming in the blue Caribbean. We were really bummed. But, what can you do? We had to trust the captain that skipping HMC was the right call. In the end, I guess it was – as we heard that a day or two later, HMC was hit quite hard by the storm and even suffered some damage. So onward we sailed, to our next “first” port of call, Aruba. Again you can see by the above photo that the weather was not the beautiful blue skies we’d hope to enjoy. But what the heck, we boarded our tour bus to see what there was on the true DESERT island of Aruba. 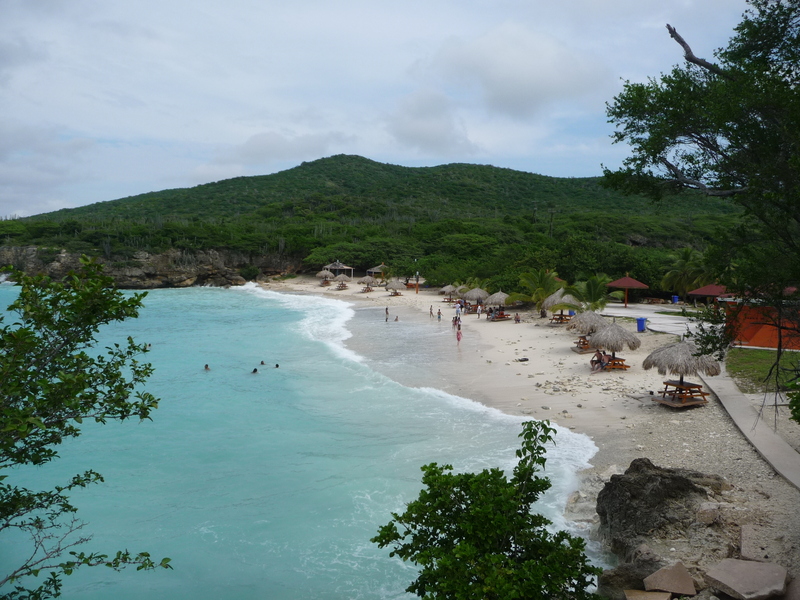 One place we stopped was at the Casibari Rock formations. We climbed up on a large rock and snapped a few photos. We learned that Aruba has NO water source, except for the desalination plant and that they charge an arm and a leg for the water. There was one area on the island where all the snazzy hotels are located. The rest of the island was really quite poor. 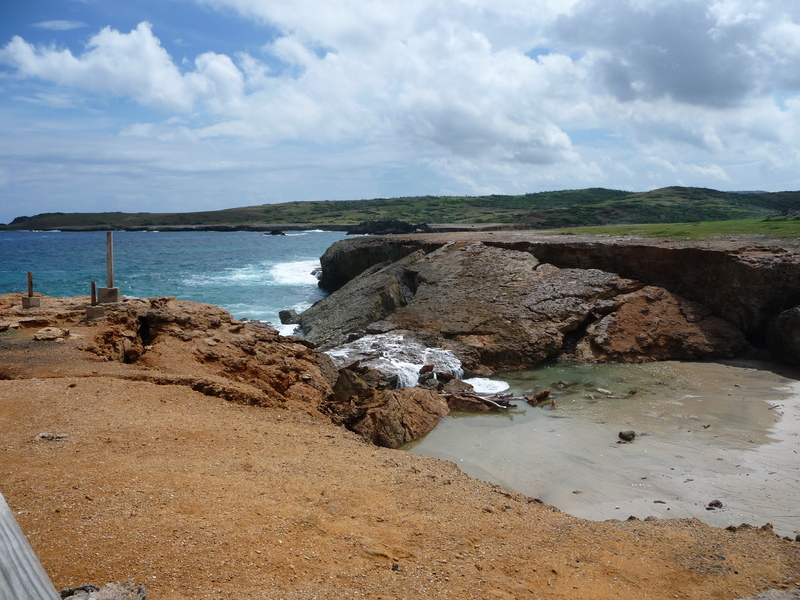 The drove us out to the north side of the island where we could see the “Natural Bridge”. 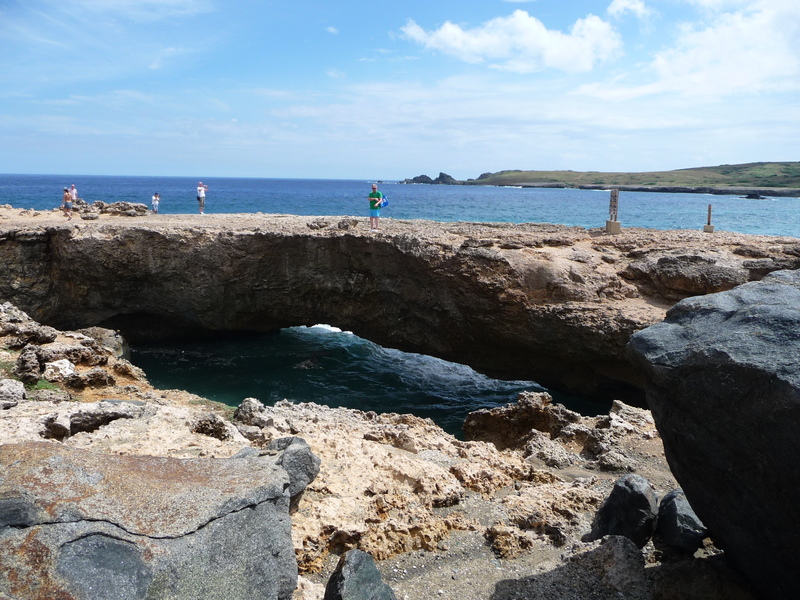 Along the way, they admitted that the Natural Bridge had sort of collapsed…. Yikes, the “Natural Bridge” is no more! But never fear folks, because right beside the collapsed Natural Bridge is…. The tour guide told us VERY clearly that Baby Bridge is unstable and that absolutely no one should walk on it. It appears that everyone most everybody got that message. 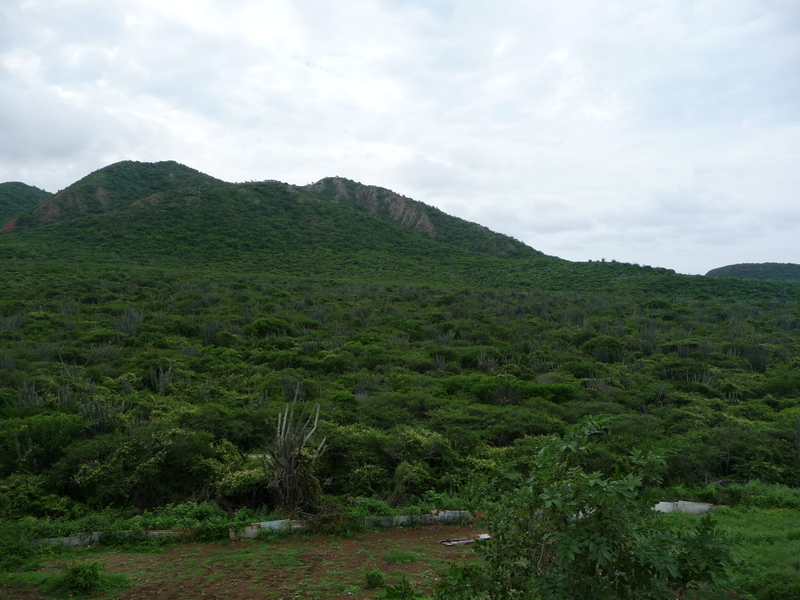 All in all, it was interesting to see Aruba ,but to be perfectly honest we have no desire to return. We did the “Town and Country” excursion to try and get a feel for what the island was all about. One of our stops was at a beautiful beach that was pretty much only used by locals. Our guide said that the water was very rough due to the tropical storms surrounding that nasty hurricane, and that NOBODY should be in the water on a day like that due to strong currents, etc. We knew by our guide’s statement that our beach excursion, scheduled for later that afternoon, would undoubtedly be canceled. We were all set to spend the afternoon snorkeling in the beautiful, calm, clear, blue waters of Curacao. We were told that the waves had apparently destroyed the beach we had hoped to visit, leaving nothing but rocks. Not sure I bought that explanation, but at any rate our excursion for the afternoon did not happen. We never got the chance to even dip a toe into the enticing blue water. Another huge disappointment. 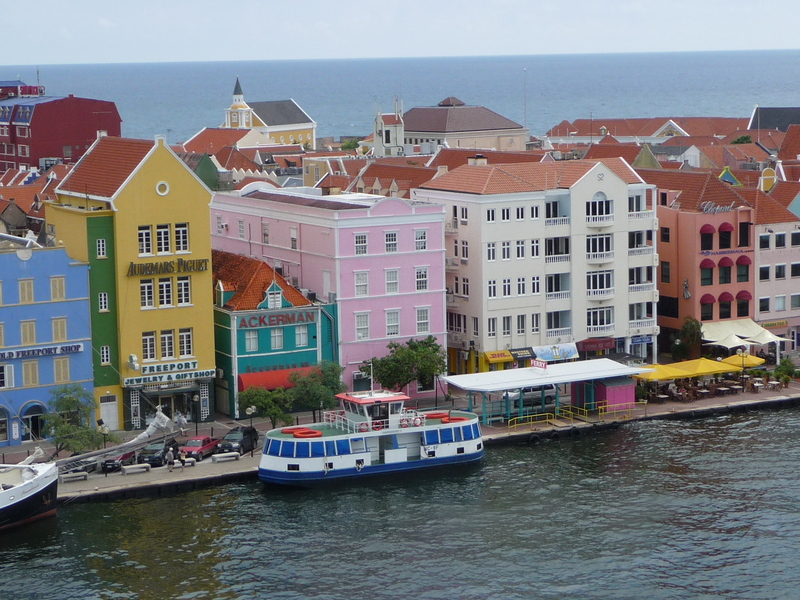 Gotta admit though, the areas near the cruise ship dock are really cute… all painted different pastel colors! This is what I’d call an “oceanside pool”!! 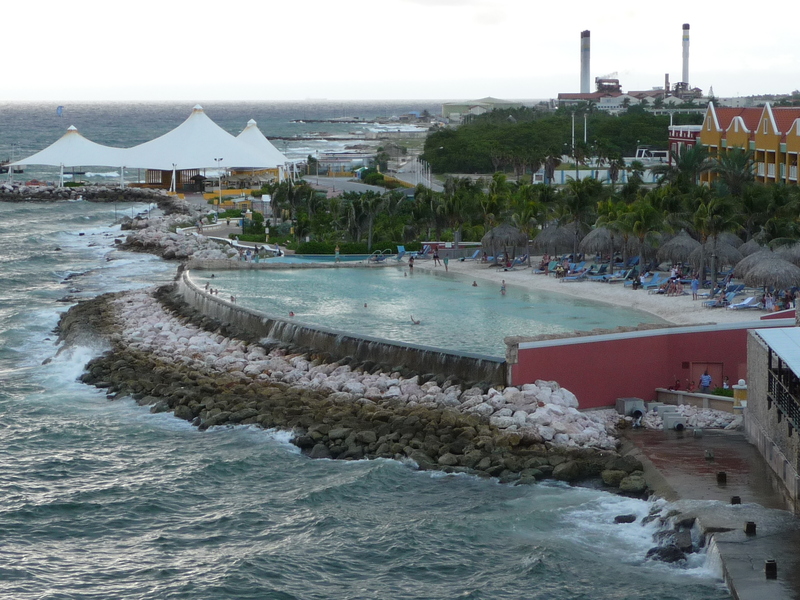 As our ship was leaving Willemstad Curacao, I snapped this shot of an oceanside resort with what appears to be a killer pool! Looks like FUN to me! 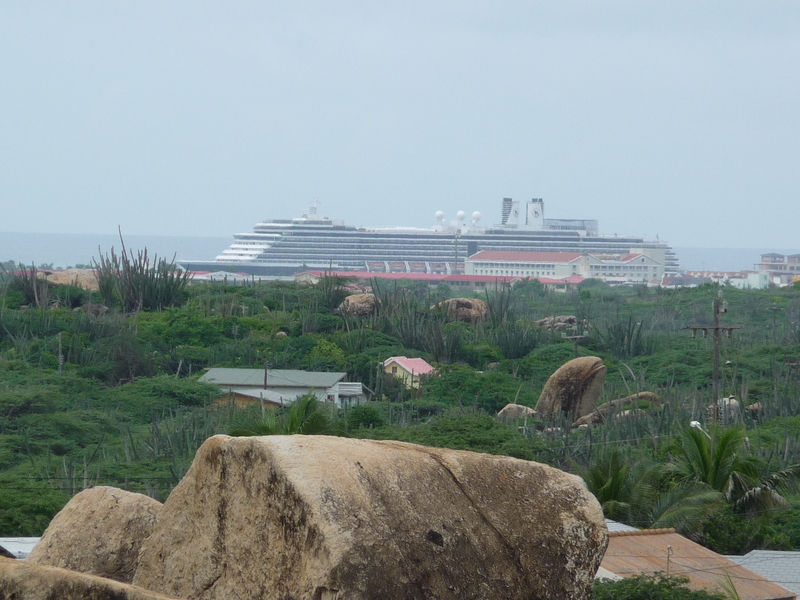 This entry was posted in General Musings and tagged Aruba, Caribbean cruise, Curacao. Bookmark the permalink. Have been wondering where you have been and there you have been cruising around the Carribean!! Looking forward now to reading about the Panama Canal.